Yes, I find it amazing too. Me and Daphne's third ice-cream dessert in three days. 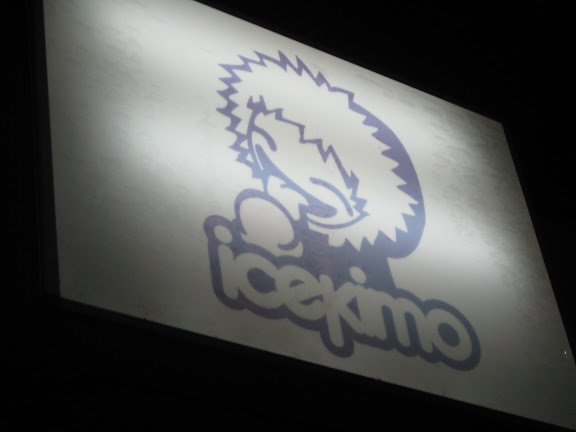 Udders, Pluck, and now Icekimo. I was driving towards Hooked on Heads when she spotted this, and I put on a (very) weak and fleeting objection about us eating ice-cream again. Ice-cream (and chocolate) is something I don't think I can ever say no to. Pretty girly layout of the stall if you ask me, but somehow or another it does exude a type of lively and cosy feeling at the same time. 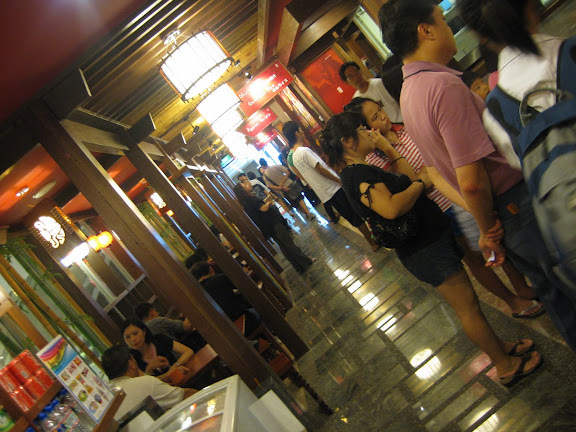 Business is good too, with a lot of youths coming in for takeways. There's banana splits, waffle bowls, waffles, fondue, as well as a large but most enticing looking 6 (or 8)-scoop and 4 (or 6)-topping tub called the Iceberg. If I had a high metabolic rate, I would have had the large Iceberg I'm sure. Ah, sinful looking indeed, but it was heavenly. I liked the thick chocolatey taste of the milo ice-cream, and the horlicks one wasn't too bad as well, but would have done better if there were more maltesers bits in it! We counted only around four broken parts, which would add up to a single one haha. We would have preferred the waffles a tad more crisp though, but otherwise it was alright. 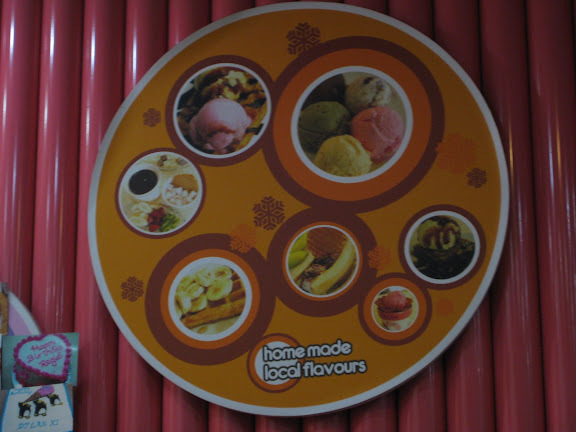 Friendly, they serve the ice-cream to your table if you're eating in. 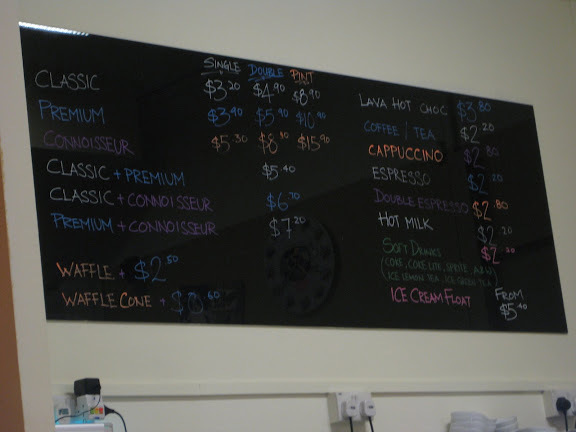 A bit pricey on the waffle bit actually, since the waffle bowl would only cost $0.50. I wonder if they got the amount right. Me and Daphne meant to have roti prata at Casuarina Curry, but the car park was full and I made a U-turn back down to Upper Thomson Road. Since we realised that we have been going to Roti Prata House far too often, we decided to have dinner at Hooked on Heads instead. While known for their curry fish head, part of their menu is also dedicated to Thai specialties, which explains the "Thai" label that I'm using for this post. If you have room for dessert, please try their Banana Fritters Special, it's awesome. 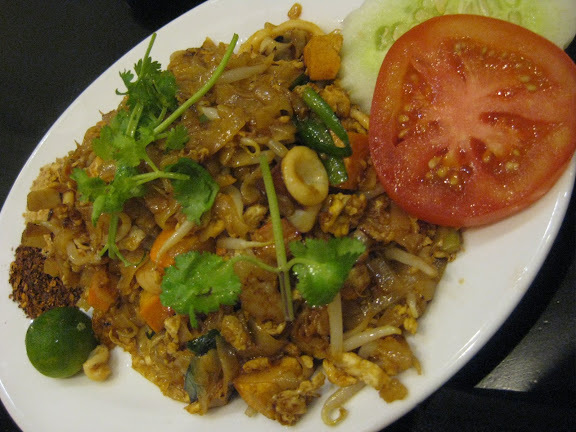 I don't know what part of this dish is "Thai", but it's still tasty, that's all that matters I guess. 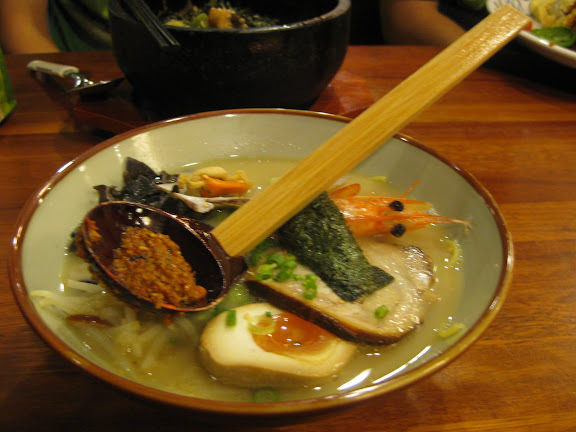 The general portion is just nice, and if I may add, generous serving of squids too. Daphne had this (again) but like in the past, it could really do with less tomato sauce. Adequately moist without being too wet, and pleasantly fragrant. 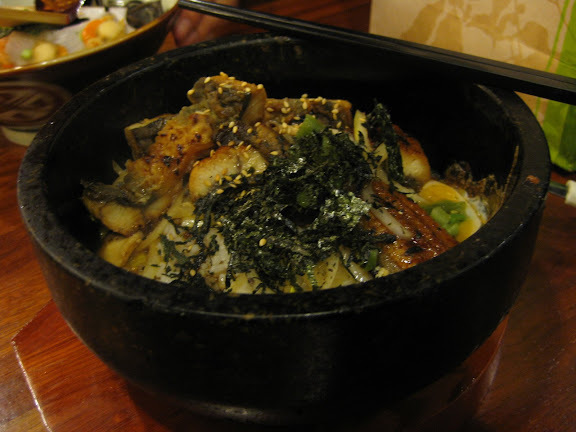 The next time we return, we will order the curry fish head! *Prices subject to 10% service charge. 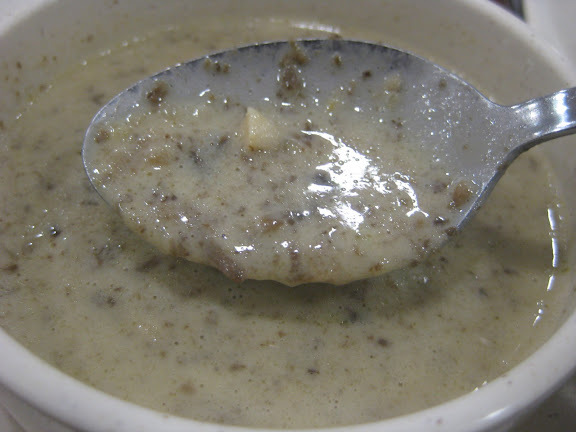 All dishes are pork and lard free. Nestled in one the dimly lit lanes of youngsters puffing on shisha is a small shop selling clothes, quaint gift items and yes of course, ice-cream! 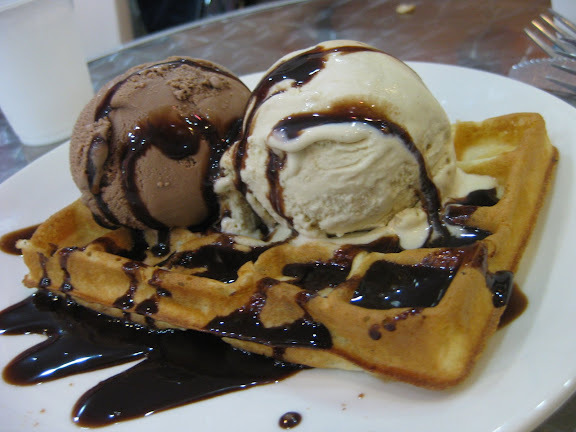 Me and Daphne just had Udders ice-cream yesterday, and here we are craving for more of this heavenly delight. Daphne refuses to admit that she loves and craves for it as much as I do, but she'd share it with me nevertheless haha. 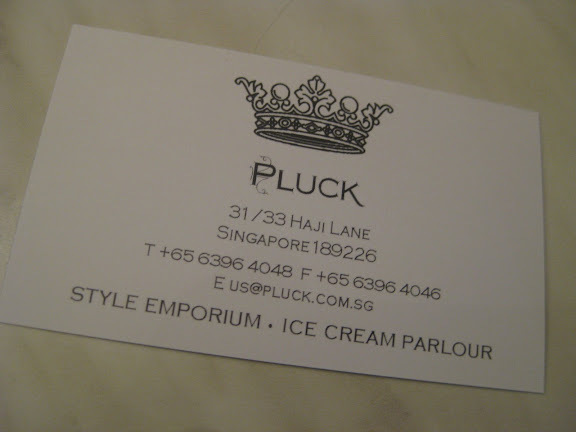 Perhaps the draw of Pluck is not really it's out-of-this-world flavours, but rather it's serene atmosphere and comfy seats, which makes for great chilling out if you're here with a small group of friends. Here you can sit, talk and enjoy your ice-cream, while at the same time watching a remake of the opium addiction problem from the glass. Nah, I'm just kidding about the last bit, they're just kids having fun ha. Not straight from Walls ice-cream tubs mind you, we may have chosen common flavours but the quality here is much better of course. Smooth and milky, I like. We were chatting with a friend, and after a while I decided that I just need to taste at least one of their novelty ice-creams, and settled for the banana choc nut. A choice well made I would say, the banana flavour was not overpowering like some others, and went really well with the chocolate and minute bits of nuts. The girls here are really friendly and sweet. $3 for a single, $5 for a double. 7mins walk from Bugis Junction. 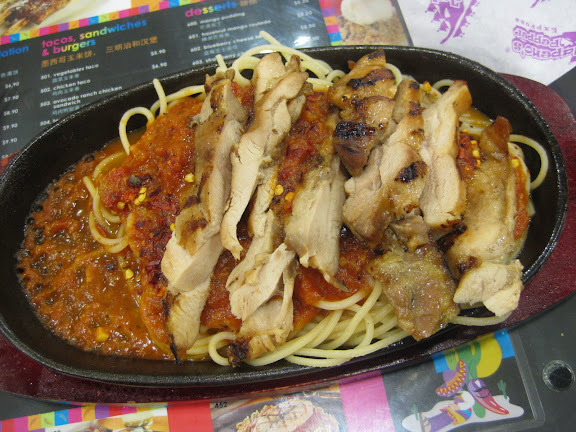 More on the food from Bugis Junction's food court! If you hadn't known, "penyet" means flat (and "ayam", chicken). If I'm not wrong, it has its origins from Indonesia and what they do is really just use the sides of a chopper to literally flatten the fried chicken thigh or breast. 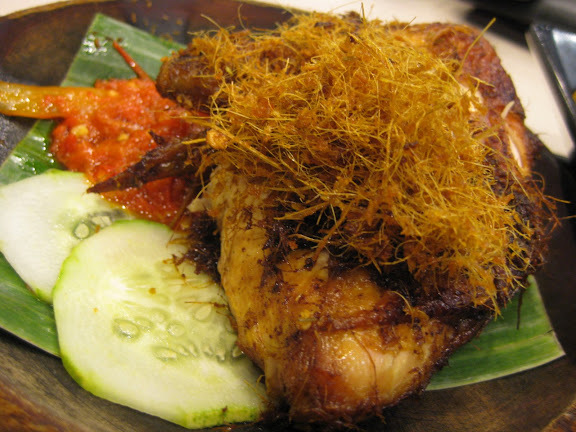 I've tried some of the ayam penyets around, and I dare say this one from Bugis is one of the better ones because the chicken is very tender and isn't dry. The special chilli served with it gives the dish a spicy kick too, and you might like to ask for more the next time you're ordering it. 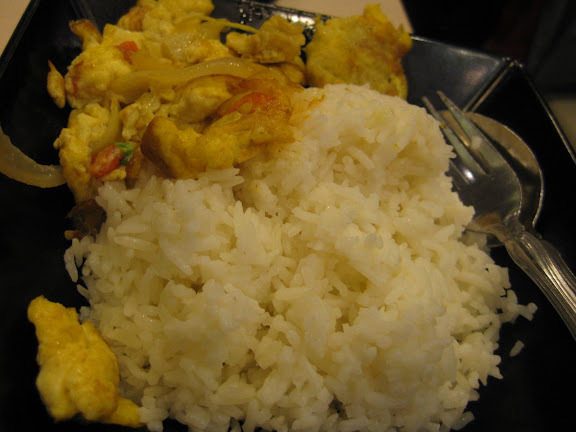 This stall however does not serve the usual piece of "tempeh" (fried fermented soybean) as a side, which explains why I added the fried eggs as a side ($1). 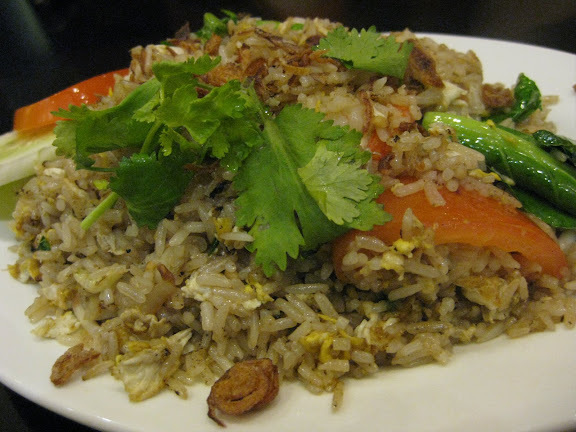 Otherwise, it would just be the chicken and the rice, at the price of $5.70. Daphne bought this from the pasta place located right next to the drinks stall. Pictures can be quite deceiving, and the portion was quite small actually. 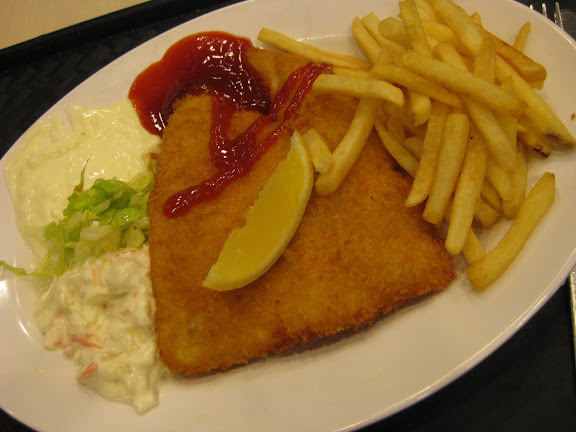 Perfectly ordinary fish and chips, no oomph factor to it, and normal fish fillets used too. Not exactly worth $6.70 if you ask me. 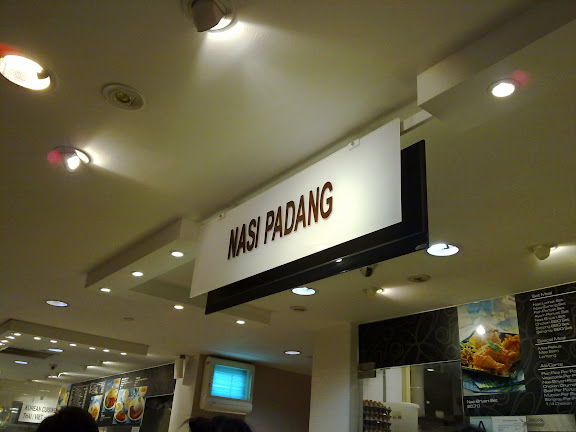 Food Junction, Bugis Junction #03-30. I love ice-cream. I wonder if, when I was a baby and had my very first taste of ice-cream, that I had grimaced from the sudden rush of cold, but then immediately wanted more. I've seen quite a few parents try it out on their children, and the little ones look awfully cute smacking their lips and gesturing for another lick. Ice-cream does the same for you, doesn't it. I mean, if you're not being too health-conscious and all, one or two scoops never seems enough right! 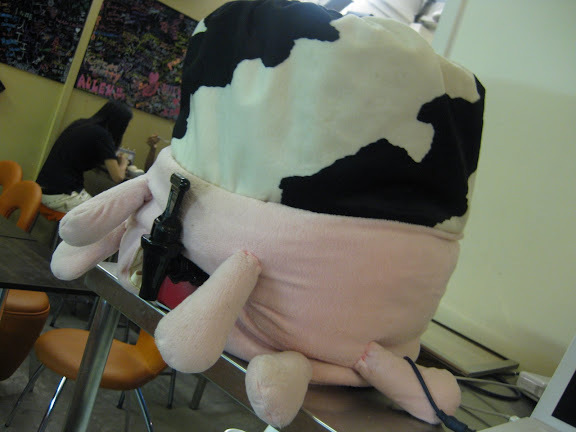 Ice-creams from Udders is like that too, you want more. In my previous visit here I was looking at their big chalkboard asking for suggestions for new flavours (trust me, it's filled with them), and I wondered if any of them would ever be realised. 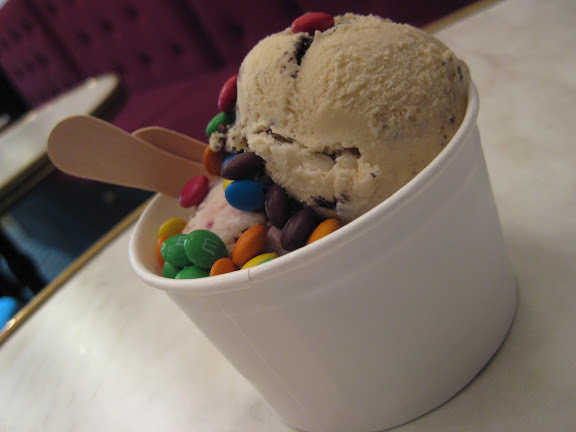 I was looking at old pictures which I took at Udders and found that two which they have short-listed have actually already made their way to the tubs - salted caramel and ... Snickers Mars Honeycomb Vanilla! The Snickers Mars Honeycomb Vanilla ice-cream was fantabulous - sweet, crunchy and milky all in one. The honeycomb pieces were a tad large though, Daphne was wondering why I was taking big spoonfuls of ice-cream, as if I was afraid she would take more of it haha. Really good stuff. As for the strawberry fields, it was great too, and wasn't as soury or fruity as the Mango Sorbet we had previously. I think this is so cute! Hahahahaha. Udderly-funny. Friendly. 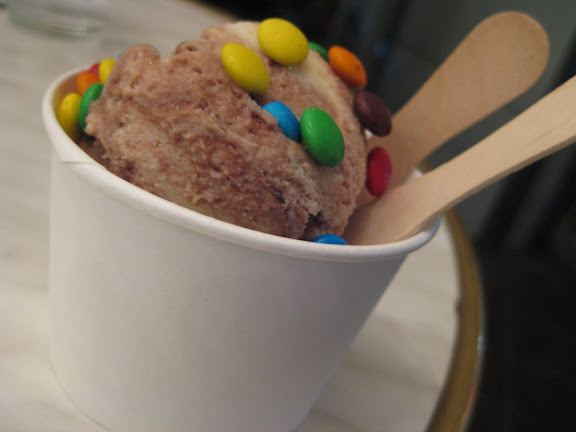 Maybe it's a prerequisite that all ice-cream girls have to be as sweet as the ice-cream they serve, I don't know. But have you ever seen a moody ice-cream girl (MacDonald's don't count)? They're always so bright and cheery. 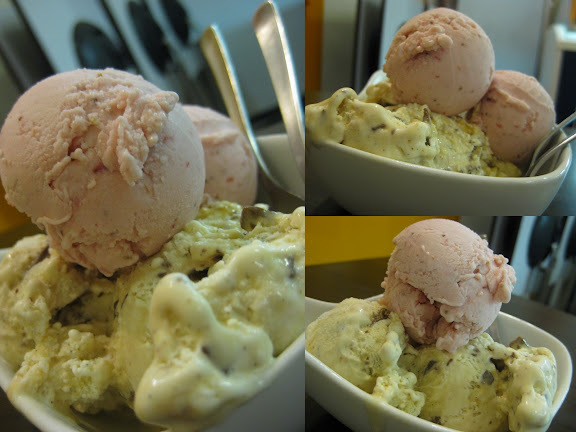 $4.90 for double scoops (classic flavours). 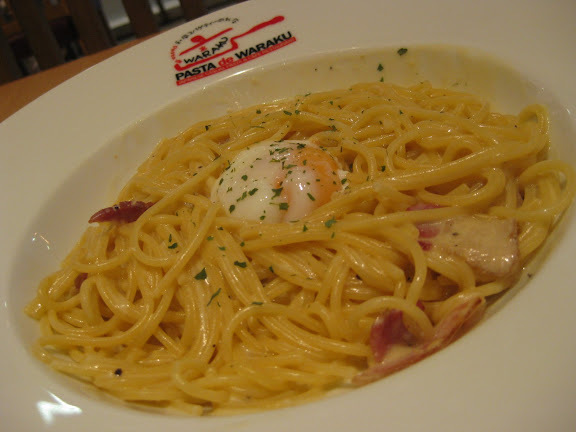 Me and Daphne had our reservations about coming to Pasta de Waraku because of the terribly small portions during our previous visit here. I felt however that it deserves a second chance, especially since Globetrotter's at United Square (our initial choice) has closed down for yet another branch of Thai Express. We were feeling veryyyyy hungry alright, so since we knew that portions here weren't that large, we decided to go for their sets, which features a gratin (or pizza) with a pasta, corn soup as well as a small serving of salad. 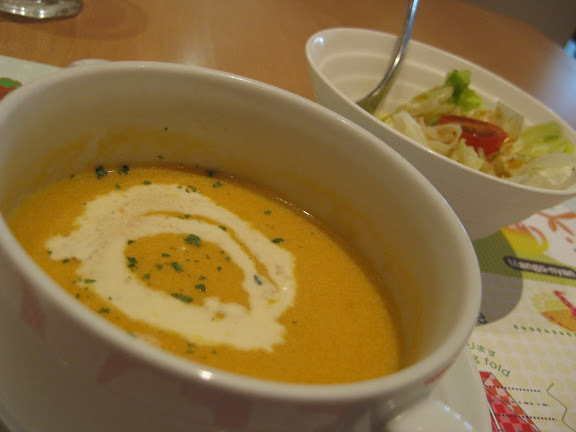 The soup wasn't too bad, but the soy sauce (or so we think it is) ruined the salad. When the first plate of pasta arrived, our eyes widened. Crikey, the portion seemed to have increased by more than half, if not doubled. 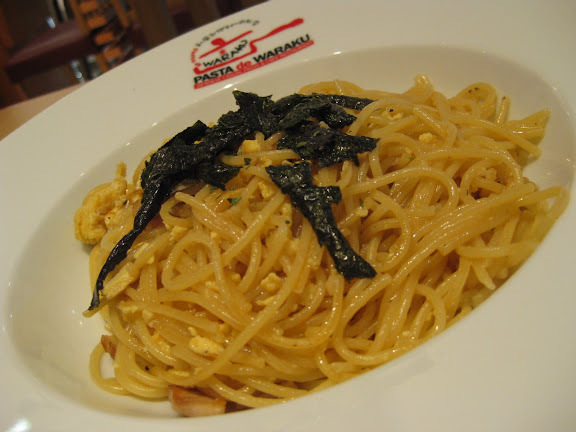 Good on you Pasta de Waraku! On taste, I felt it was pretty good, the spaghetti's texture was just nice, and the oil used was perfect. Very filling. I made sure that I took some forkfuls of gratin while I was in the middle of eating my pasta because I didn't want to do injustice to the gratin by tasting it when I was too full. Still, the gratin failed to impress because it really tasted somewhat microwaved (I'm not suggesting it was), with the cheese and penne a little too hard on some parts. 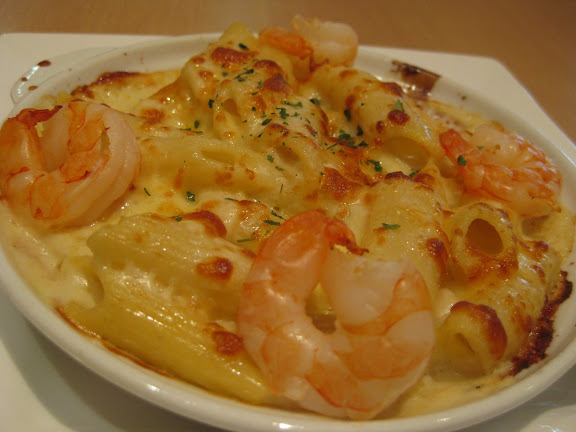 Daphne had the gratin set as well, but chose the cabonara as her choice of pasta. She thought it was quite good, but was too full to even eat a quarter of her gratin. So girls, sets like these aren't for you, leave it to the guys! 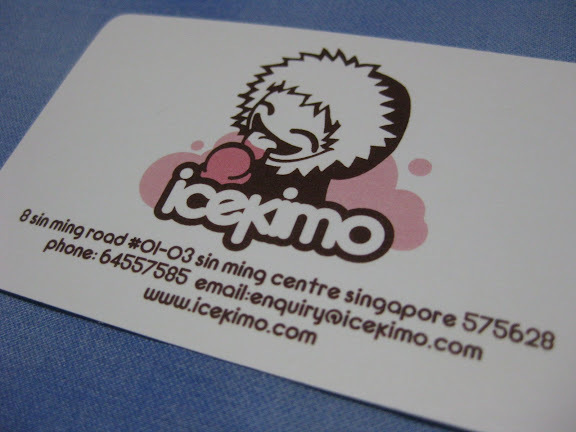 $16.80 per set, subject to GST and service charge. 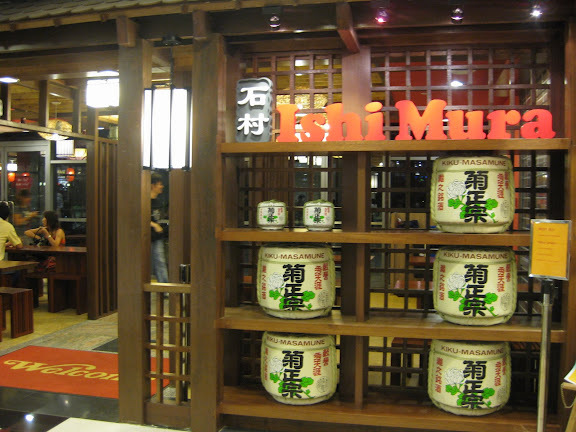 John mentioned that he had watched a television programme about this Japanese-concept food court that has recently opened at the new wing of Yishun Northpoint, and suggested that we try it out. 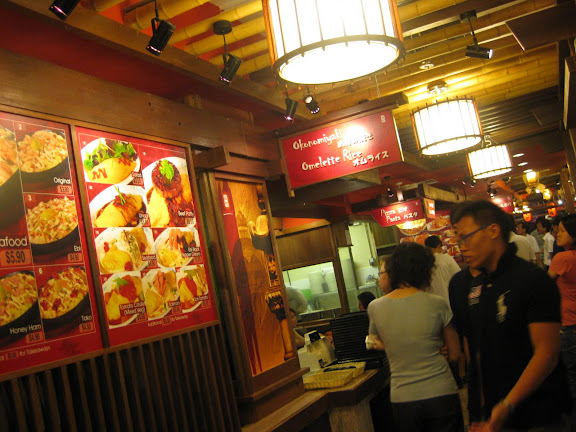 When you step into Ishi Mura, you get the feeling of being in both a Food Republic food court as well as a Shokudo restaurant at the same time. 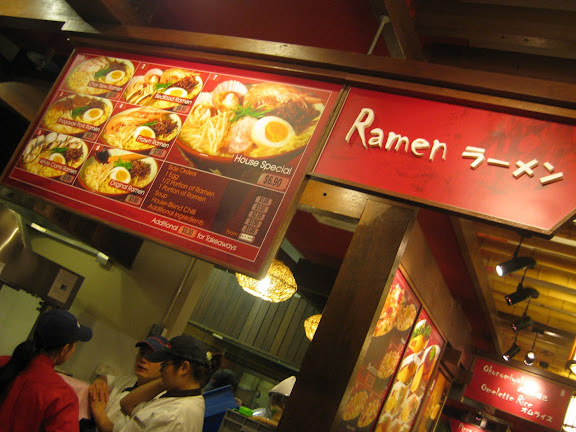 Probably from the excessive use of wood all around and the scattered displays of Japanese characters haha. 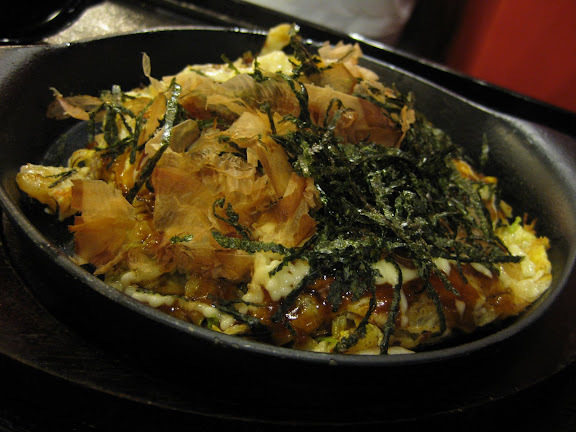 Ishi Mura has pretty much the usual fare of Japanese that many Singaporeans are familiar with, from the ramen to the okonomiyaki (a pan-fried batter cake, with cabbages and various ingredients) to the now increasingly popular Japanese wafer-thin pizzas and "omu" (omelette) rice. 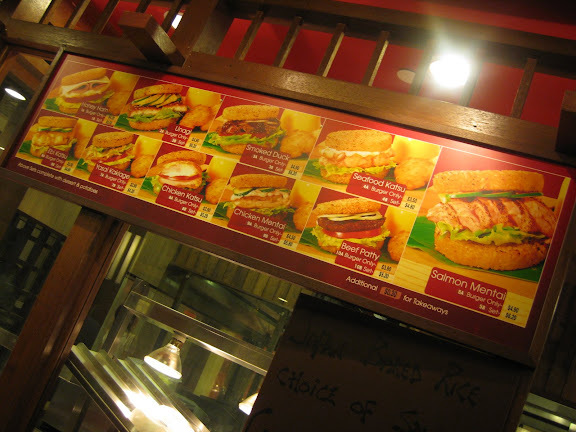 It also has a stall selling a variety of rice burgers, in which rice is used instead of burger buns. 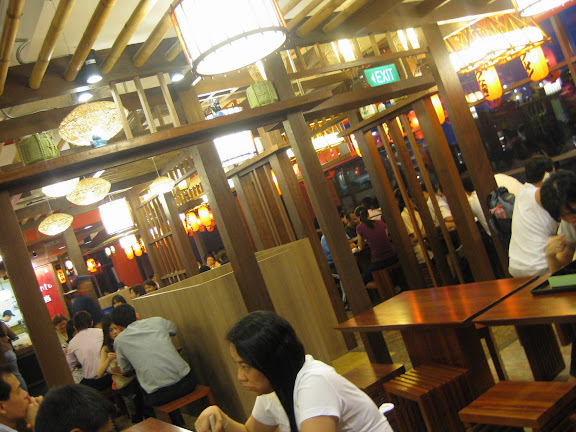 I think the best thing about Ishi Mura is the price because the food here is very affordable. Almost everything is under $10 and it certainly gives Shokudo a huge run for their money, because on taste, Ishi Mura might actually be better in a number of aspects. 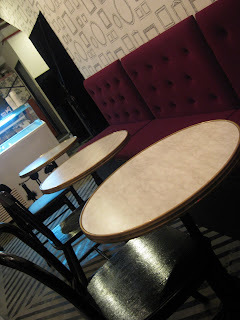 This is how the seating area looks. It's comfortable enough, and wasn't that packed for a Wednesday night. Perhaps not many people outside of Yishun have heard of this place yet. 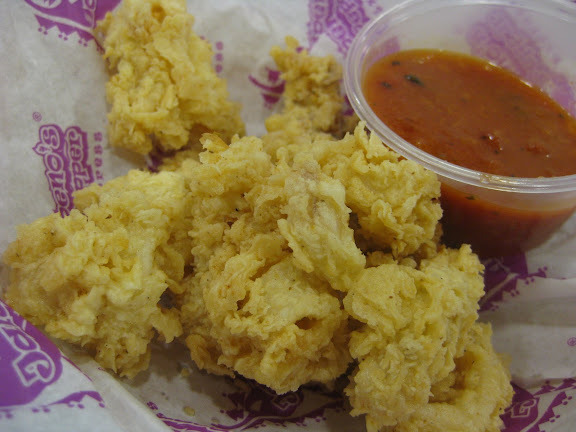 If you compare this to the one sold at Bugis, this one is sooooo much better. 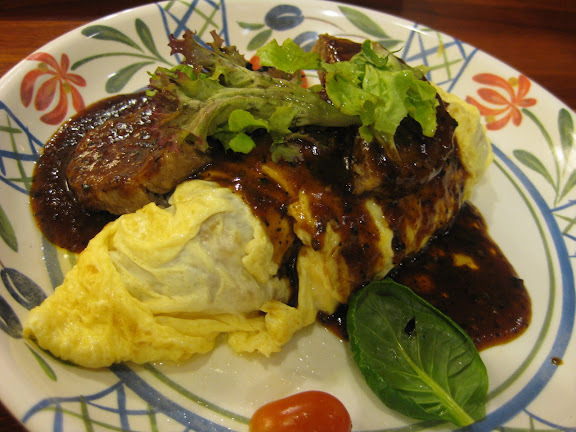 While Rakeru (the stall in Bugis) focused on sloshing ketchup all over the dish, Ishi Mura uses black pepper gravy instead, which to me is the more appropriate way to go since the rice is already more or less tomato(-sauce) flavoured. The eggs were really soft yums. This was served on a stone bowl, so be careful when you're handling it, because it's hot. Darren who had this said it wasn't too bad. Maybe John doesn't really know you could make pictures look better. Or maybe, he was just hungry hahaha. The next time John, I'll take the pictures! The three of us shared this and we all felt that this was good stuff, though I have to admit that we have not eaten a good many okonomiyakis around to know what exactly can be considered "good". Still, the portion of seafood that went into this dish was generous, considering that it costs only $5.90. Eat it while it's hot and crispy! Here's just some of the menus from some of the stalls, in case you're interested. Click on the pictures if you can't see the prices clearly enough. 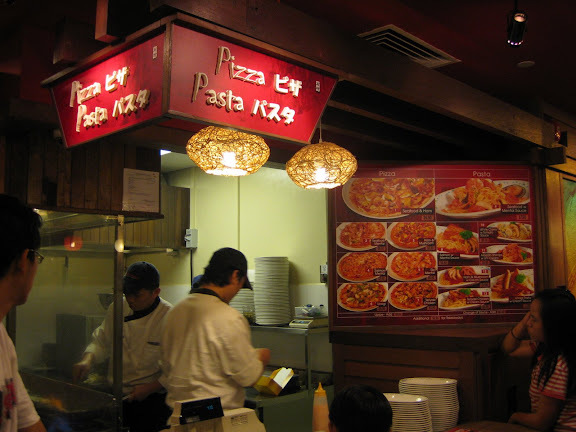 And let me just add this picture of the pizza-pasta stall, even if you may not really see the items that they have on offer haha. 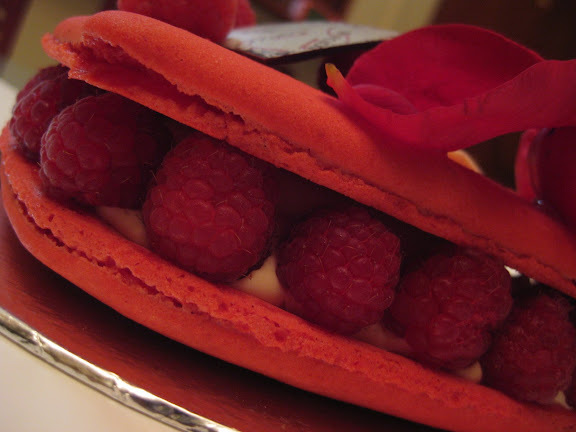 Perhaps I did have one small surprise in store for Valentine's, and that was the macaron-cake I got for Daphne. 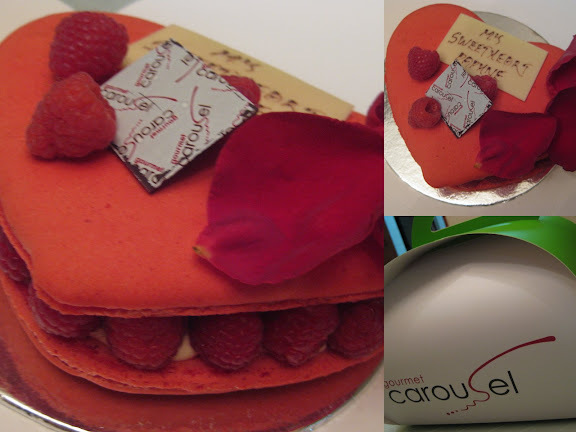 I was initially thinking of the round Rose Ispahan for her, and was delighted to find that they had created a special heart-shaped design just for the occasion. 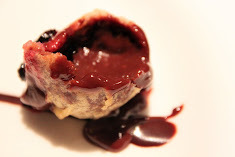 The box, I have to say, isn't as pretty as Canele's, but it's so adroable, isn't it. Looks as if it could fit that small furry CJ7 creature in it haha. 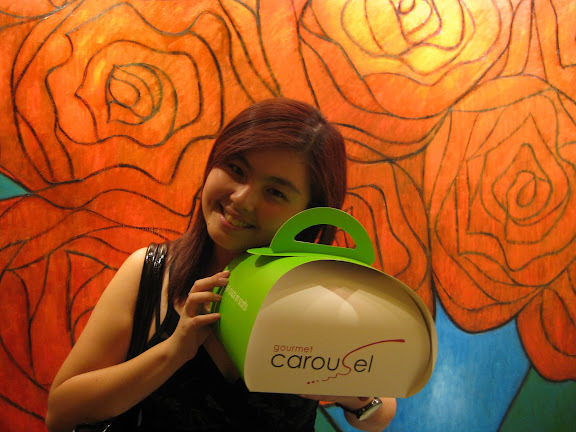 Well, I think a cake box from Carousel beats those tiny bouquets any time, as I could tell from the glances we got from couples. I have to say it's really quite a pretty! Gourmet Carousel uses the rose-flavoured macaron to make this cake they call the "Ispahan", which also comes in dessert-sized portions at around $7. On taste, I have to admit it didn't meet my expectation just a teeny weeny bit, because as much as the macaron tasted great, the cream inside wasn't anything impressive. The raspberries were alright, but Daphne preferred the small slices of lychee within the cream itself. $28.00, $30 if you include GST. I really wish that there could be more California Pizza Kitchen restaurants around in Singapore, other than that solitary one at Forum. The quality of pizza is much better and not your usual run of the mill types like those served by Canadian Pizza and to some extent, Pizza Hut. 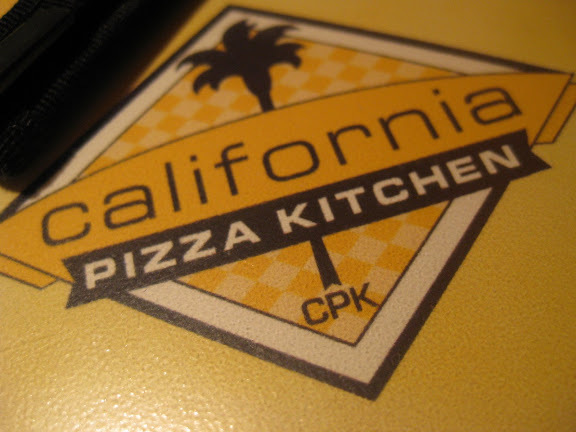 Eating one of California Pizza Kitchen's popular pizzas always reminds me of my junior college days when I would come here with my classmates after school and indulge once in a while. 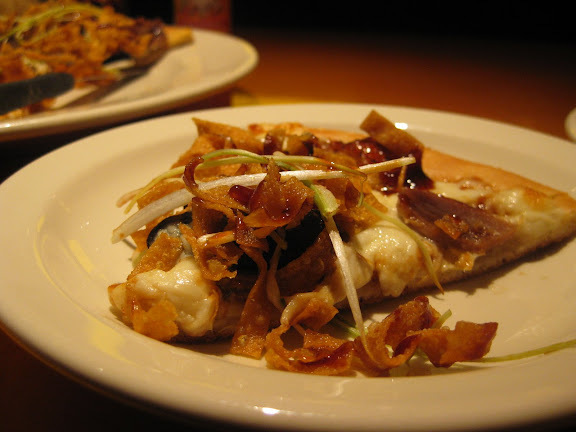 Real slices of duck mixed with crispy wanton skins to add a mixture of textures on this tasty pizza. 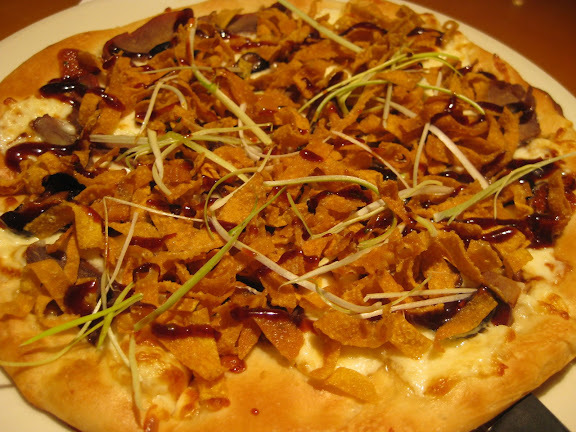 The dark sweet sauce used gave it an oriental flavour while still retaining the typical pizza "taste" of dough and cheese, which is a good thing. It's not exactly large, it's about six small slices. If you're hungrier you could always share two pizzas with your partner, but I myself would think that two is probably too heavy. 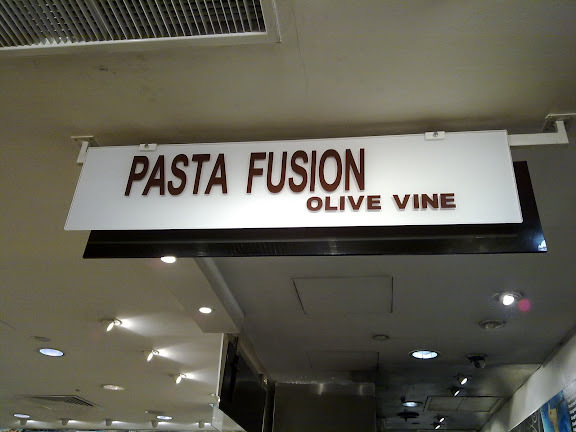 They have very delicious-looking pastas as well, which me and Daphne agree will make us come back soon. Anyone tried the "kung-pao" spaghetti yet? Looks yummy! Good, but you have to ask them to refill your glasses with iced water rather than expect them to come round your table. If you're interested to know more about their menu, head to this link. 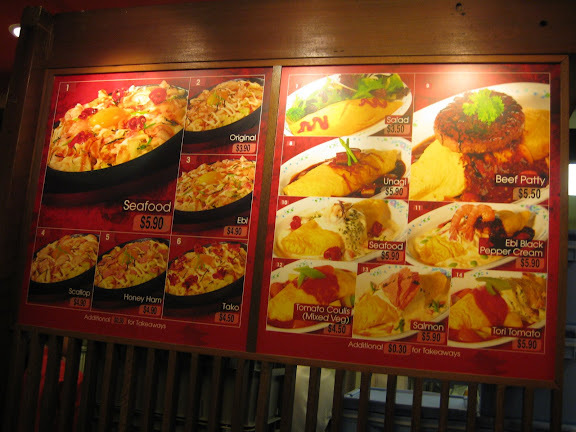 I'm thinking that their Singapore menu is almost identical to this online one for their American outlets. Located just outside of KFC at the newly extended basement of Lot One Shoppers' Mall is a very small Halal-certified eatery that serves simple Western fare at very (I repeat: very) affordable prices. Me and Daphne thought it was worth a try, especially since we were reluctant to head up to the usual (boring) foodcourts on the upper levels of Lot One, and other than a handful of restaurants, there didn't seem to be much else to eat actually. So how does the food measure up? The first thing that struck us was the portion, which was pretty small if you ask me. You're probably saying, well, what do you expect for $3.20? Haha. Much more actually! I quite liked the tomato, spaghetti-like dip that came with the calamari, though I still think it would go better with the usual tartar sauce. The batter for the calamari is ... too ordinary. For just $2, this was better than expected. 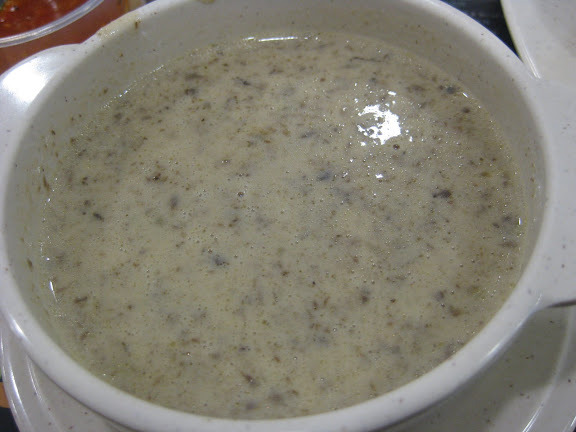 We liked the fine bits and pieces of mushrooms in the soup, and the fact that the soup was fairly thick and not as diluted as those soups sold at the same price elsewhere makes it a plus point here at Jalapeno's. Part of me wanted to ask the staff if "blackened" merely meant more carcinogenic substances piled onto the grilled beef. Instead I merely asked that my burger be served plain with neither coleslaw nor lettuce since I wanted to savour the beef on its own. Don't bother about it being rare, medium or well done, I think it's just a toothpick flag that means nothing, they do not ask you how rare you want your beef in the first place. 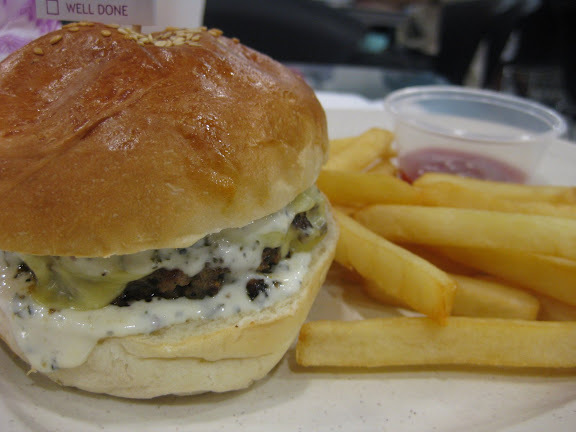 On taste, it was actually tasty, not just because of the mustard or tartar, but largely by the freshness of the beef patty and the way it was cooked. It's a sizeable patty, not that thick, but not thin like MacDonald's hamburger or Big Mac patties either. Nice choice of bun, the sesame seeds certainly added a little extra flavour. Daphne had this, and it came out better than expected as well. As you can probably tell, we didn't come to such a small eatery with much expectations, which probably explains why the food actually came out to be even tastier! Plus, we were absolutely hungry as well. See, the different factors involved that affect your taste buds. 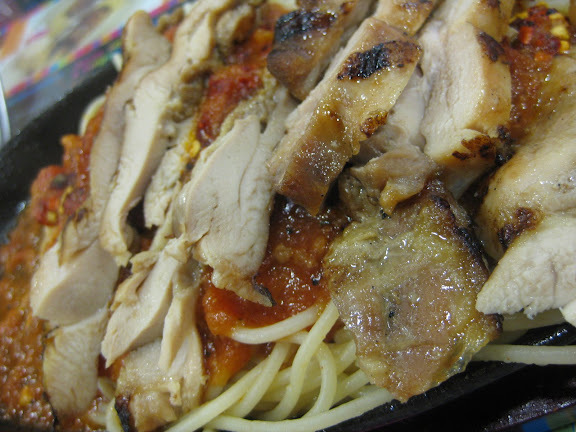 To be fair, the chicken slices, though not exactly warm, were still tender enough and went very well with the spaghetti. This dish could have done better with slightly more spaghetti gravy and chilli flakes, but otherwise it's not too bad.